"I have always loved traditional log cabin quilts, but wasn’t interested in making one in a traditional way. This quilt was constructed like a traditional log cabin except that none of the blocks are square. Instead of using a rectangular grid I drew lines at various angles so the blocks became quadrilaterals of different sizes and shapes." 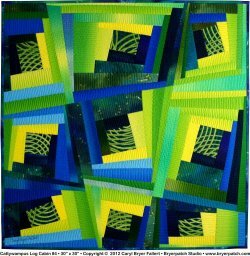 NOTE: Caryl does a wide variety of artistic workshops, and for many of them, she provides a free, downloadable pattern. This project is from one such workshop. 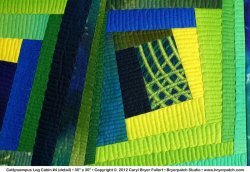 For inspiration on the creative process and for some highly artistic quilts, be sure to take a look at Caryl's Gallery pages! She has a huge variety of beautiful quilts she's designed over the years!